Store your cigars in this impressive, handsome 200 stick humidor. Sure to impress friends and guests, this sleek humidor is perfect for a desk, corner or table, & will look good complementing a wide range of decors. The interior is lined with premium kiln dried Spanish cedar. 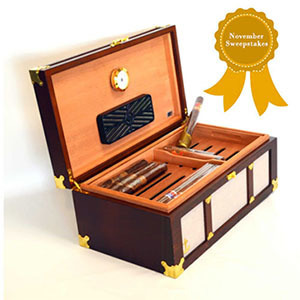 With some luck, you may be the November Sweepstakes winner of this SAN TROPEZ CHERRY & LINEN 200 CIGAR HUMIDOR. As most other Cigar Enthusiasts we hate irrelevant junk mail and therefore we pledge to use your email address within our stores only to update you regarding cigar and accessory deals or for relevant cigar news only. We will protect your privacy as if it was our own. Only adult residents of the United States aged 21 or older are eligible for this Giveaway. Each participant may only enter their personal email address and by entering agrees to these Official Rules which also include: No Purchase Necessary. Purchase does not enhance the chance of winning. The Giveaway may be entered directly once per day. Winners are chosen at random using either electronic or manual methods of drawing from all eligible entries. Winners will usually be notified by that email address within one week after the drawing, and must confirm receipt of the winning notification, provide full name, address reachable in the U.S.A. by the USPS, within one month of the email notification. The Participant agrees that this email address may be used from time to time for promotional considerations by Cigar Leisure and its affiliates. State and local laws vary, therefore this giveaway is void where prohibited. All prizes are provided in Good Faith, and good condition. On shipping ,prizes become the property of the recipient. Prizes are provided free of charge and with free shipping deemed to have no monetary value, are not returnable, and cannot be exchanged if they arrive damaged in transit, get lost in shipping, or disappoint otherwise. Please note that items like lighters, and cutters are inherently dangerous, and for adult use only, and the prize winner takes over all risks associated with improper use. The giveaway prizes are not for commercial resale.